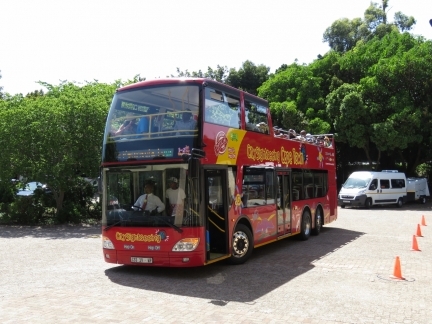 We purchased a City Sightseeing day pass that allows us to take unlimited rides on any of their four main bus routes and get on and off at any stop along the way. 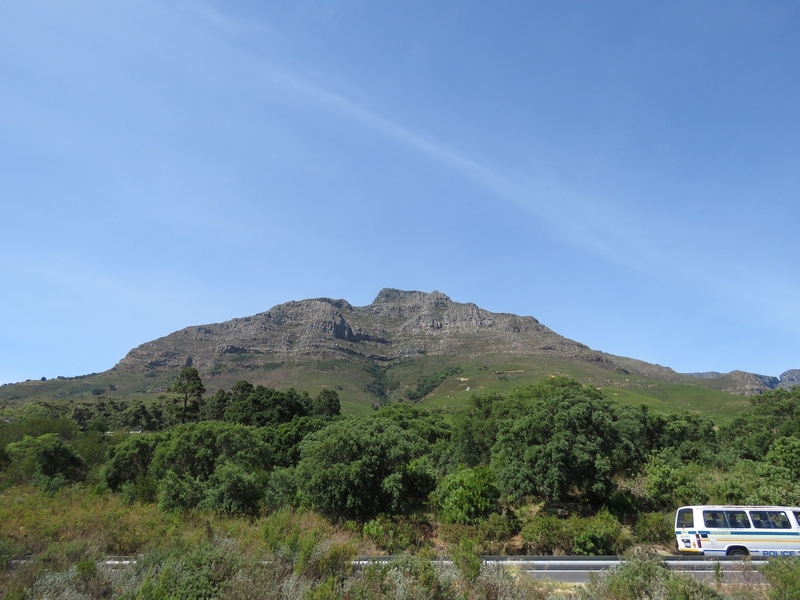 We started off on the Mini Peninsula Tour, which runs through downtown Cape Town, then east of Table Mountain to Hout Bay, and back along the Atlantic Coast. 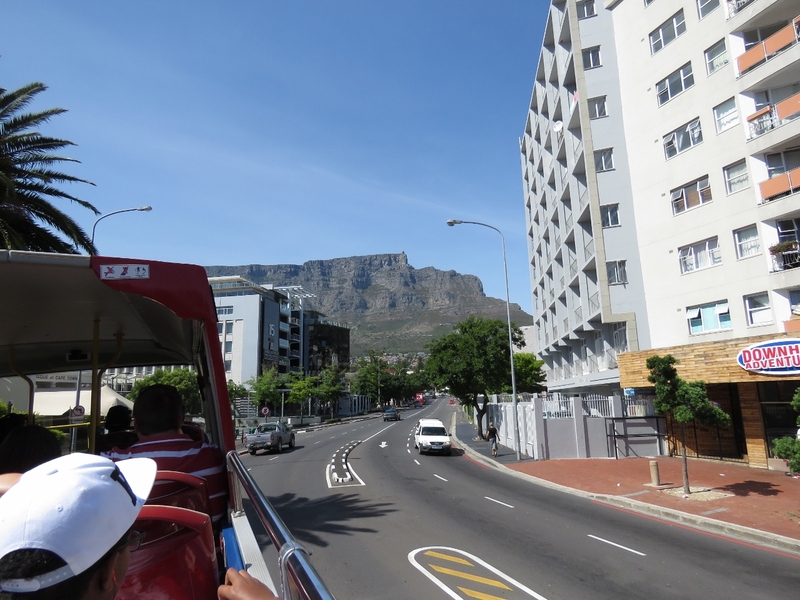 Here we are passing through downtown Cape Town with Table Mountain in the background. The five-star Mount Nelson Hotel has hosted many celebrities and dignitaries include Agathie Christie, Arthur Conan Doyle, Winston Churchil and U2. 3,300-ft (1,000m) Devil’s Peak is a prominent landmark in the Cape Town mountain backdrop when viewed from the water. The City Sightseeing buses are more commonly called the Red Buses for obvious reasons. Our first stop was at the Kirstenbosch Botanical Gardens. 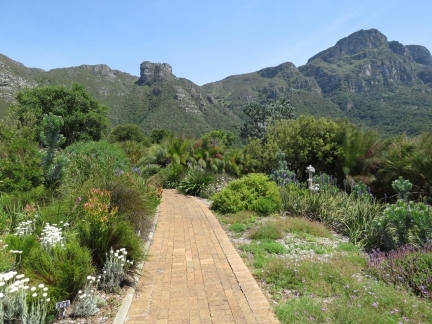 The 36-hectare property showcases about 9,000 of Southern Africa’s 22,000 plant species. 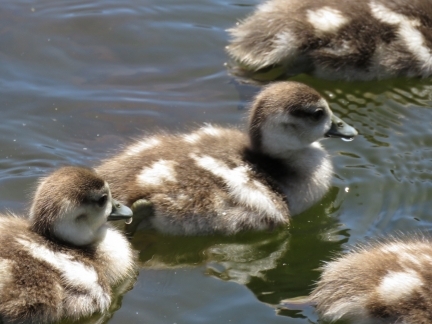 Fluffy goslings at the Main Pond in Kirstenbosch Botanical Gardens. 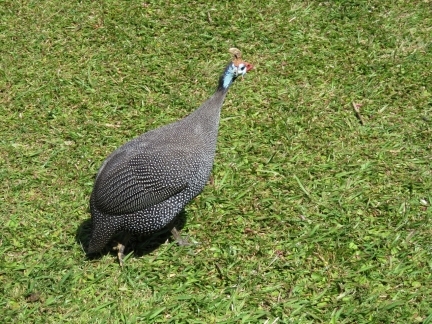 The Helmeted Guineafowl is native to Africa and common at the gardens. These striking pincushions were in full bloom in the expansive Kirstenbosch Protea garden. 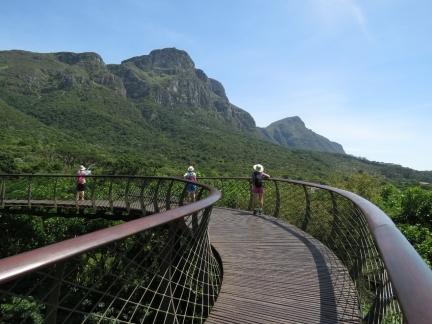 With its combination of unique flora and dramatic scenery, Kirstenbosch is considered one of the most beautiful botanical gardens in the world. 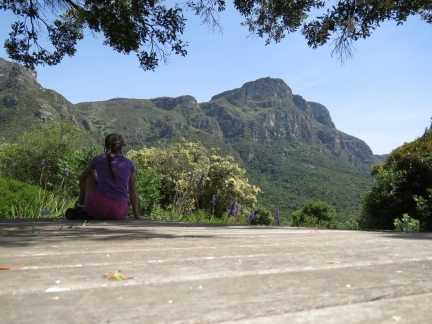 Taking in the scenery, and getting a bit of a sun break, at the viewing deck. The 130m Tree Canopy Walkway leads 12m aboveground with great views across the gardens. 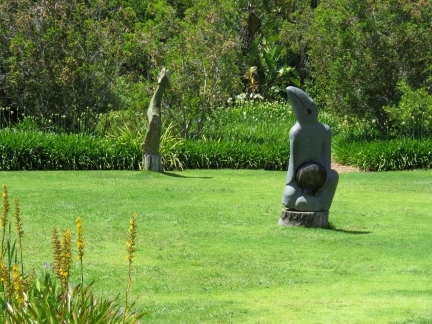 The Sculpture Garden features a rotating display of African stone sculptures. A glimpse through the trees to the Constantia Valley where South Africa’s wine farming industry began in the late 1600s. Our Red Bus day pass includes a tour through the vineyards, but we already had a full day ahead of us and stayed on the Mini Peninsula bus route. The beach at Hout Bay was busy on this warm, sunny Sunday. We arrived at Hout Bay just before noon and were able to snag a patio table for an excellent meal at the popular Wharfside Grill restaurant on Mariner’s Wharf. 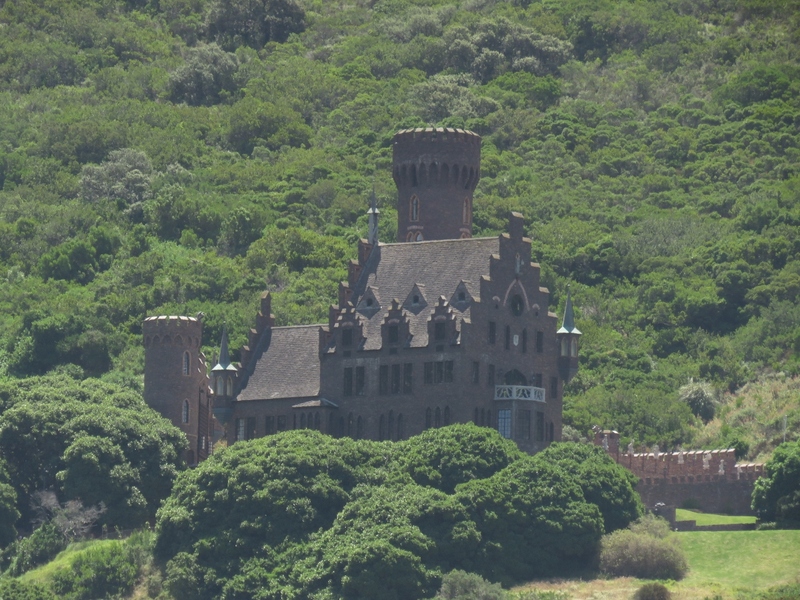 Perched above Hout Bay, the privately owned Lichtenstein Castle was modeled after its German namesake. 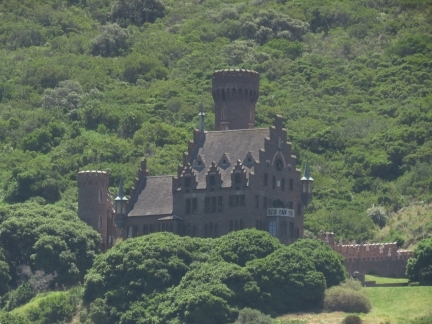 The castle was completed in 1998 and apparently took longer to build than the original. 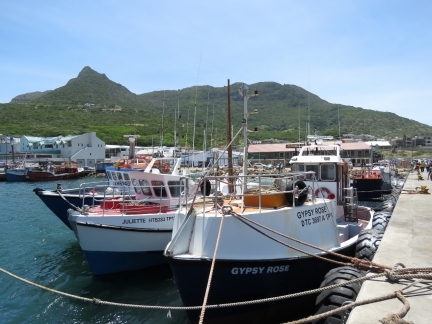 Hout Bay is an active fishing harbour and was crammed with fishing boats. The return trip north hugged the Atlantic coast with close-up views of the dramatic scenery we’d first glimpsed en route to Cape Town on Dirona. 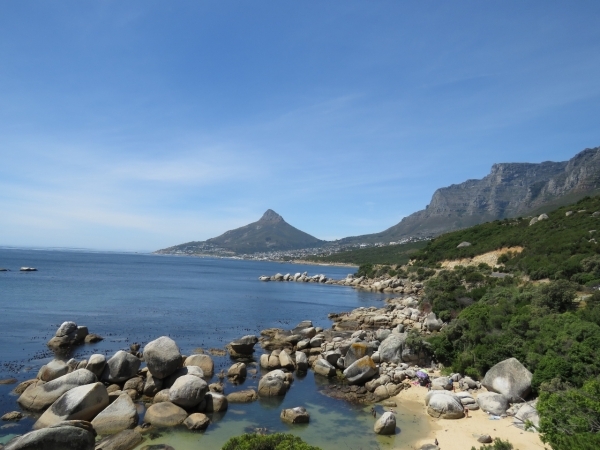 Above us are the ridges known as the Twelve Apostles with Lions Head in the distance. 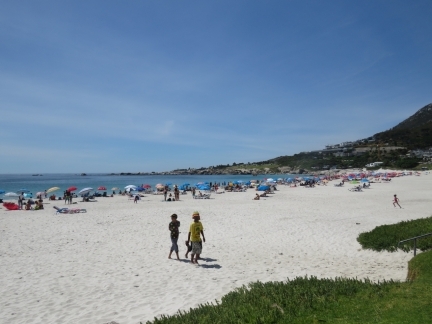 Camps Bay is an exceedingly popular beachfront resort area packed with hotels, restaurants and people. The Green Point Lighthouse, built in 1824, is South Africa’s oldest working lighthouse and can be seen for 25 nautical miles. 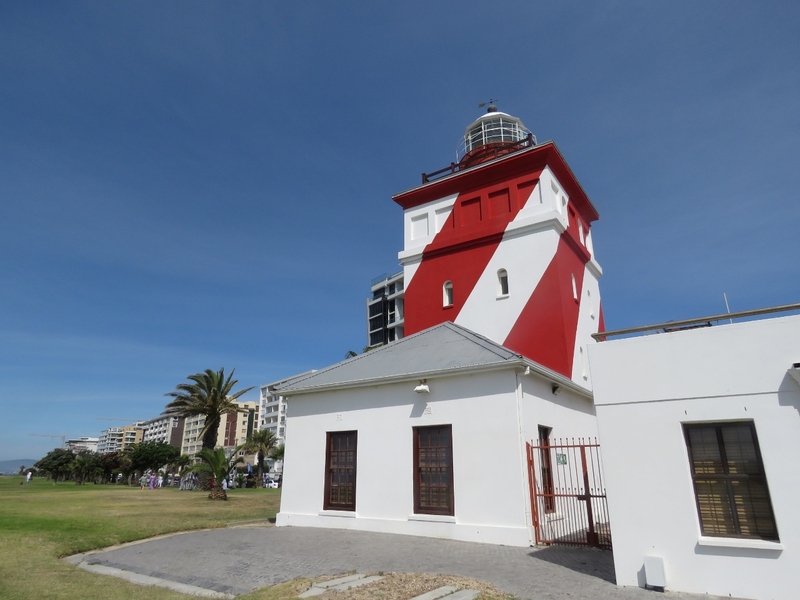 We were hoping to tour the light, but it was closed. 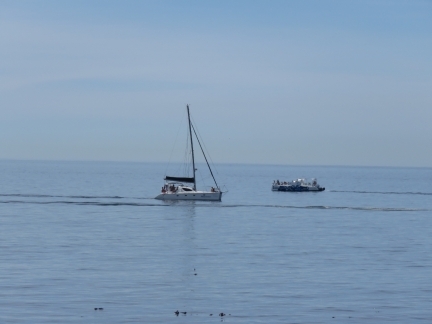 It’s a nice day to be out on the water. 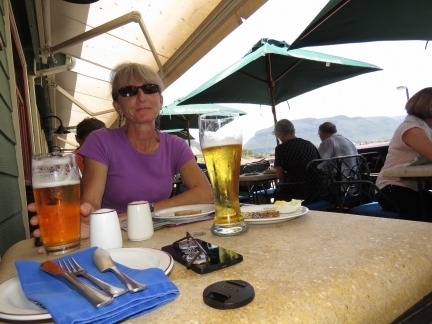 Just being nosy here but what is that round device on the table in the photo from Wharf Side Grill? That’s a camera lens cap sitting on the table in the forefront of the picture. Thank you for posting a very nice series of photos of your stay in Capetown. 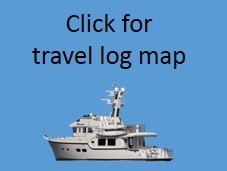 One question: have you had any concerns about personal security in your travels when out and about ? 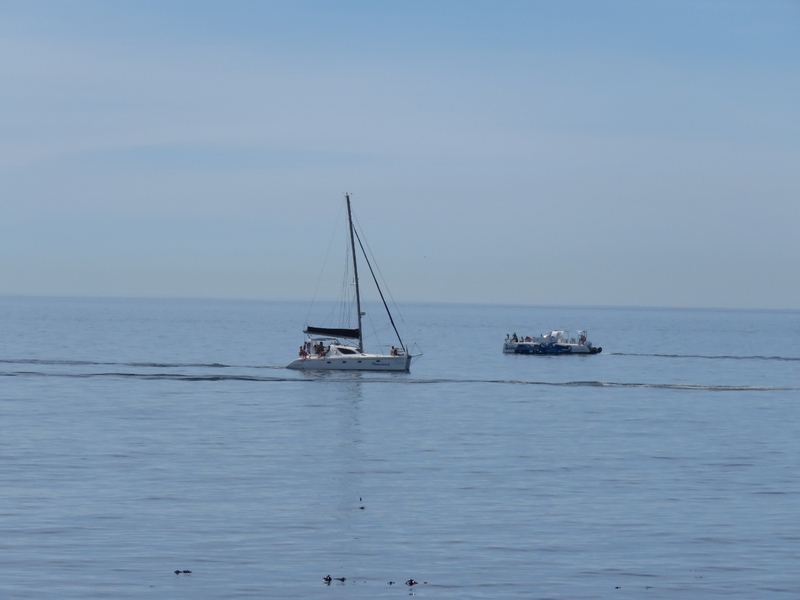 I assume the marina is protected. 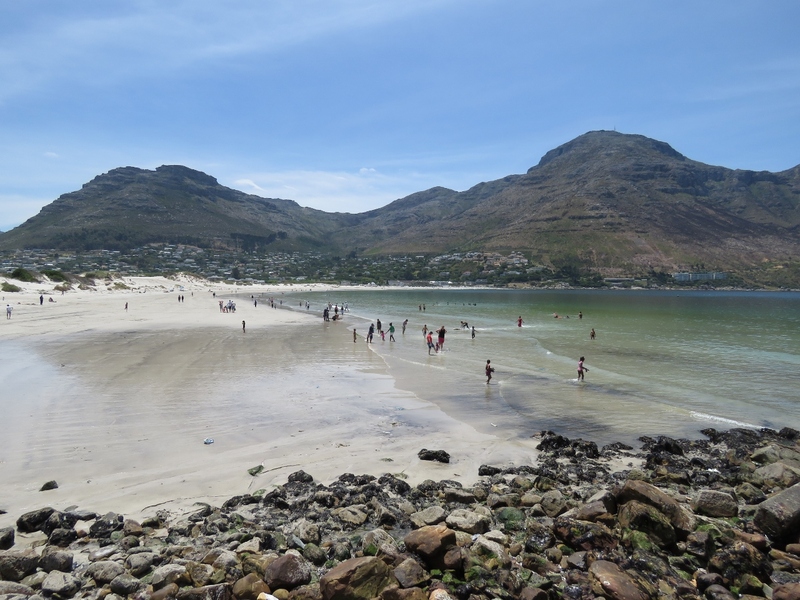 The marina seems secure and the surrounding V&A Waterfront has a very large security personnel presence and also appears fairly safe. Locals warn us frequently to be careful, purposeful, and watchful downtown even during the day. 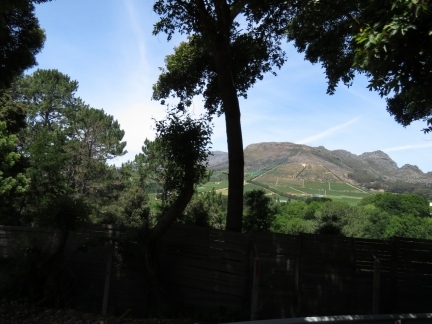 It didn’t seem that bad but we wouldn’t go there at night. I’m often carrying a camera and many recommend that it not be exposed which is kind of hard advice to execute upon while at the same time taking pictures. Many, if not most, of the residential areas we have seen are barb wire and often electric fence encircled. 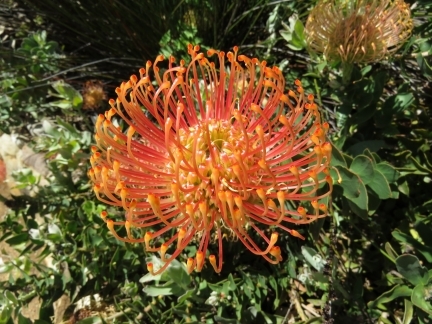 Between the security measures taken locally and warnings to be careful, it’s clear that some care is required. 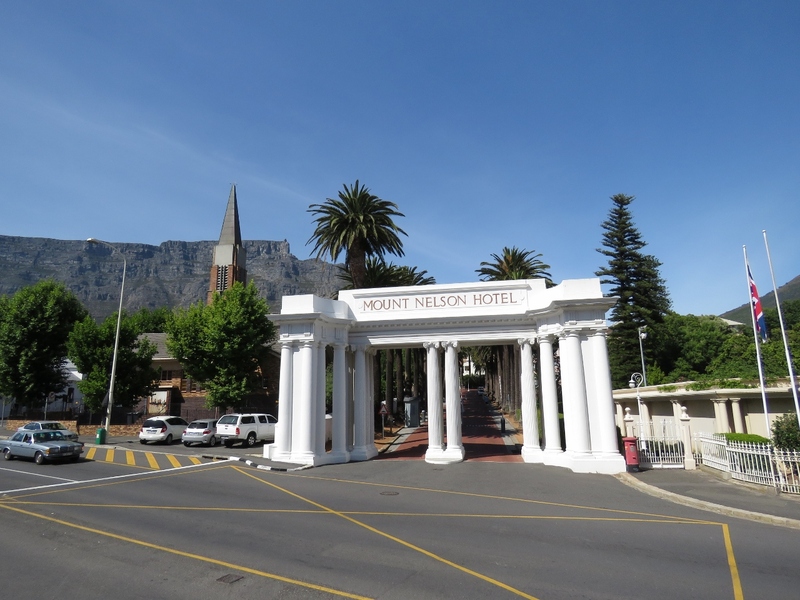 It seems they have done a very good job of security in the fairly large V&A Waterfront area and we’re pretty confident moving around that area even at night.